Image from nytimes.com, and altered. In the past 7 years, the United States has seen their honey bee population drop by about one-third. These little guys aren’t only the ones we swat at to ward off a potential sting; we depend on them to pollinate all of our fruits and vegetables. Without them, our food supply would be in serious jeopardy – which is actually a real, serious concern due to the bee collapse. So what’s causing the massive die-off? Pesticides play a huge part, though the federal government says it’s a combination of things. The USDA’s “Report on the National Stakeholders Conference on Honey Bee Health” indicates no single cause can be fingered, but that it’s a combination of pesticide use, poor diet, lack of genetic diversity, and parasites. We’d also like to include electromagnetic frequencies to that list, as both cell phones and cell phone towers have been shown to have some bizarre effects of bee populations. Several months ago, the European Union announced they would ban a class of pesticides known as neonicotinoids, derived from nicotine, blaming their use for the decimation of bees in Europe. 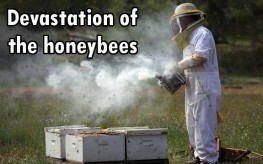 And neonicotinoids have destroyed at least 600 hives and 37 million bees in Canada alone. But the U.S. hasn’t made such a bold announcement and has instead said banning such a wide range of pesticides could cost more than it saves. This decision and similar pro-pesticide moves have resulted in bee keepers uniting against the EPA and FDA. “Colony collapse disorder” is the term used to describe the millions of dying bees. Last winter, the deaths were so significant, California almond growers were left scrambling to find enough bees to pollinate their upcoming almond crop. Compared with years past, last winter marked a loss of 40 to 50% more bees. There are numerous factors at play here. Monocultures in U.S. fields are partially to blame as bees have a far less varied diet than they have in decades past. Also, fields are much larger, giving them further and further to travel to supplement their diet with variety. Diseases, parasites, and pathogens are spreading wider and more rapidly than before as well. And we cannot highlight the effects of dangerous chemical crop applications enough. One study at the University of Illinois found residues of more than 100 chemicals, including pesticides and insecticides, in the bodies of dead bees In other words, it’s a complex problem. The problem is made more complex, however, when a government looks at solutions as solely a matter of “cost effectiveness”. An independent research company this past year found Monsanto liable for the bee deaths in great numbers from their Roundup and other products. And what does the government let Monsanto do? Why, they let Monsanto buy the research company to hush up how complicit they are in killing the bees. We are living in a corporate fascist state that not only kills bees, they kill humans too. Well, I see no actual evidence for half the claims being made here. Good going on citing the federal government though. I read that Roundup has been found to be the most devastating poison we have introduced into nature. It’s not an herbicide as stated, but a biocide (kills everything). I suspect the bee population is suffering from the use of Roundup…..and it’s causing cancer in humans as well. It should be banned too!! Use vinegar and salt mixed with a little dish soap and it works! Try it. Much cheaper too. Is that what you’ve read?